THE MOST BUOYANT SLEEVELESS WETSUIT EVER. The World's most buoyant and technologically advanced wetsuit. The product of years of research and design, the Vendetta sleeveless is the 1st fullsuit with no sleeves. No restriction, no drag, Pure Speed. Rinse your XTERRA Wetsuits thoroughly with fresh water after each use; hang to dry inside out on a thick hanger; if necessary, your wetsuit can be washed by hand with wetsuit-specific shampoo; do not dry your wetsuit in a dryer or in the sun. Store in a cool, dry location out of direct sunlight. It is extremely important to take extreme caution when putting on your XTERRA Wetsuit to ensure that you do not tear it. Please read the following instructions carefully to prevent tearing your new wetsuit. It is easiest to put on a clean, dry wetsuit, so after each use make sure to properly rinse and hang your wetsuit. Begin by putting your wetsuit on at your ankles. Work the material up in each leg of the suit towards the crotch starting at each ankle. Once the wetsuit is all the way up (there isn’t a gap between your body and the wetsuit at your waist), begin putting your arms in the sleeves. Adjust the arms by working any extra material beginning at the wrists up into your shoulders. There shouldn’t be any air pockets (gaps between your wetsuit and your armpit) in either armpit of the wetsuit; this can be checked by feeling under your armpit to determine whether or not the material is flush against your skin. If there are any air pockets, you must work more of the arm material into your shoulder starting from your wrist. Have a second person help you zip your wetsuit. Ensure the interior zipper flap is flush against your back. One hand should always grasp the base of the zipper while the second hand zips your wetsuit up. Once your wetsuit is zipped up, bend over 90 degrees and pull the ripples near your stomach out away from your body. Work the ripples up from there into your shoulders to increase comfort in your shoulder and neck area. If you feel pressure at the front of your neck, repeat step #6 on the back of your wetsuit to alleviate any lingering pressure (until you get into the water, it may still feel a little tight). A vast majority of the time, the wetsuit is simply brand new and the neoprene requires stretching out through use. Often, users forget to properly adjust their wetsuit (as explained in “Getting into your XTERRA Wetsuit” - above); properly adjusting your wetsuit will alleviate the neck feeling overly tight. Swim in your wetsuit! Your wetsuit will expand approximately half of a size once you get into the water, so please test it. Allow a little bit of water to enter through your neck to alleviate additional tension in the neck. Ensure the wetsuit is as high as possible in the crotch area; next, make sure the arms of the wetsuit are worked up toward your shoulders adequately enough to allow for full arm extension above the head. If you feel pressure on the front of your neck, bend over 90 degrees and pull the ripples near your stomach out away from your body. Work the ripples up from there into your shoulders to increase comfort in your shoulder and neck area. If you feel pressure at the front of your neck, repeat the previous step on the back of your wetsuit to alleviate any lingering pressure (until you get into the water, it may still feel a little tight). Swim in your wetsuit; it will expand half of a size in the water! Take advantage of your opportunity to test your wetsuit in the water before making a final purchase decision. The wetsuit has extra bunches of material in the stomach, legs, back, and under arms. The wetsuit doesn’t feel snug on dry land; it doesn’t fit flush against your body everywhere. There’s a gap between your lower back and the base of the zipper, forming an air pocket in which water can get trapped. A second person is unable to zip your wetsuit up for you. You struggle to get your wetsuit all of the way up in your crotch or neck. You are unable to take a deep breath without struggling. The wetsuit is pulling down on your shoulders since it feels too short in the torso. 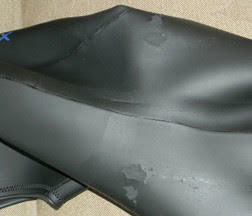 XTERRA Wetsuits are warranted against any manufacturing and material defects for two years from the date of purchase. Manufacturing defects covered under the two year warranty include seam tears or separations, stitching tears or separations, and gluing defects. XTERRA Wetsuits Australia (vide TITAN Performance Group) retains the right to repair or replace valid warranty claims at their discretion. XTERRA Wetsuits are designed as high performance open water swimming and triathlon wetsuits; these wetsuits are delicate. Fingernail and other minor tears from sharp objects are not a manufacturing defect. Minor tears like this will not affect the performance or integrity of the wetsuit whatsoever if it is repaired correctly. If not cared for correctly, other types of damage can also occur. 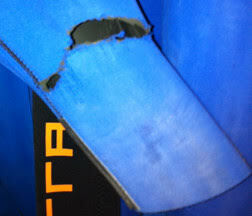 XTERRA Wetsuits are warranted against any manufacturing and material defects for 2 years from the date of purchase. Manufacturing and material defects covered under the 2 year warranty include seam tears or separations, stitching tears or separations, and gluing defects. 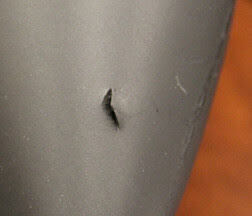 The most common damage NOT covered under warranty includes the following: neoprene tears caused by human hands/ fingernails, melting due to heat or sun exposure, heel tears, chlorine damage, tears caused by sharp objects, general rubber tears, improper repairs, other damage unrelated to the seams, stitching, or glue. The 2 year warranty only covers the original purchaser of the wetsuit, verified by transaction details. Coverage is voided if the wetsuit is sold or ownership is otherwise transferred. It is the responsibility of the customer to provide XTERRA Wetsuits Australia (TITAN Performance Group) with proof of original purchase. It is expected that customers read, understand, and abide by the guidelines explained in the Care Guide. XTERRA Wetsuits Australia (TITAN Performance Group) retains the right to determine whether damage is caused by normal wear and tear circumstances, manufacturing defects, accident, misuse, improper care, or negligence. XTERRA Wetsuits Australia (TITAN Performance Group) also retains the right to repair or replace valid warranty claims at their discretion; refunds are not an option for valid warranty claims. Exact product replacement depends on available inventory and no guarantee is made to process warranties within a certain time frame, but we endeavour to ensure you are not without a wetsuit for any prolonged period. If your wetsuit is useable and you have an event coming up, we highly recommend that you try and use the wetsuit or hire a wetsuit through other wetsuit hire service. Neoprene tears caused by human hands/ fingernails. Melting due to sun or heat exposure. Heel tears (tears caused by forcefully putting on or taking your suit off to the extent that your heel, finger, or anything else punctures the wetsuit). Damaged caused by chlorine (degradation of the gluing in the suit is the most common chlorine-caused damage). Tears due to exposure to sharp objects (i.e. rocks, reef, etc.). Damage caused by improper repairs. Other damage unrelated to the seams, stitching, or glue. *For any damage that is not covered under warranty, please refer to our Repairs Procedures. Using your XTERRA Wetsuits for any activity other than triathlon or open water swimming. Altering the wetsuit in any way, including silk screening, heat transferring, embroidery, or cutting. Damage caused by using petroleum jelly (Vaseline) or any other petroleum-based product or unapproved lubricant, cleaner or treatment. Prolonged exposure to heat, sunlight, chlorine, and other harsh substances. If the damage to your wetsuit is covered under warranty, please follow the procedures listed below to initiate a warranty claim. Please note that if you do not follow the procedures listed below, it may prevent your warranty claim from being processed in a timely manner. Your date of purchase and your confirmation receipt received, as proof of purchase. At least one clear picture of the warranty claim. Detailed description of the warranty claim and how it occurred (if known). Name on the original order. Purchase date of original order. Contact information (email address and phone number). Any other relevant information (i.e. you have an upcoming race and require an expedited response). STEP 2: Please allow up to 48 hours for a response; more often than not, we will respond much faster. If you have any questions, concerns, or comments in regards to our warranty policy, please contact the customer services team by emailing contact@titanperformancegroup.com.au. STEP 3: Customers are always responsible for the cost of shipping to return their wetsuit to XTERRA Wetsuits Australia (TITAN Performance Group). XTERRA Wetsuits Australia (TITAN Performance Group) will cover the cost of shipping back to the customer, as long as it is within Australia or New Zealand (other Asia-Pacific countries to be determined on a case by case basis). Warranties outside of this territory, may only be partially covered. If a customer would like expedited return shipping, additional fees apply. Please allow up to 10 business days for a warranty claim to be processed from the time XTERRA Wetsuits Australia (TITAN Performance Group) receives it; shipping times vary. At XTERRA Wetsuits Australia (TITAN Performance Group) we want to make sure you are satisfied with your purchase. If the wetsuit doesn't offer you a perfect fit, we will happily accept a return or exchange within 30-days of receipt of the order. The wetsuit was received over 30-days before the request date. **If your wetsuit has any damage, please read our Warranty Information for instructions on filing a warranty claim. NOTE: Clearance/ Ex-hire items do not qualify for a return or exchange. 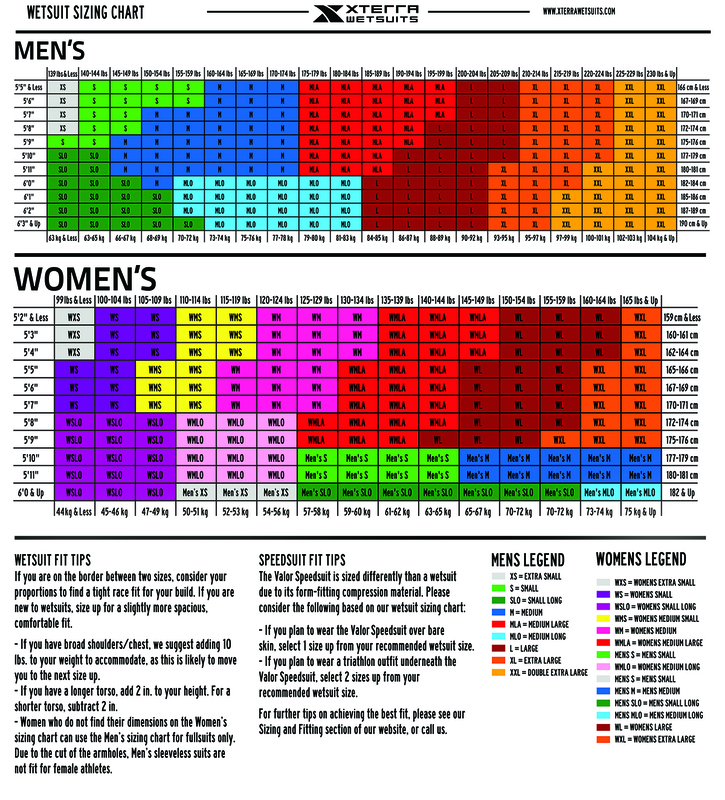 If you think your wetsuit may be the wrong size, we highly recommend reading our Fitting Guide. We also suggest that you swim in your wetsuit before considering a size exchange. Normally we do not recommend the use of our wetsuits in chlorinated pools, however, if extenuating circumstances offer no alterative (i.e. harsh winter weather), then one brief swim is permitted under the 2 year warranty. To avoid chlorine damage to your wetsuit, we suggest that you limit your time in the pool to around 5 minutes and rinse the suit thoroughly with fresh water immediately afterwards. Whether you decide to send back your wetsuit for a refund or an exchange, you are responsible for the shipping cost back to us. If a refund is requested, we will refund the cost of items returned. Shipping costs are never refunded. If an exchange is requested, we will ship the replacement wetsuit to you at no additional cost to you, but the initial shipping back of the wetsuit is the responsibility of the customer. If you need your new wetsuit ASAP, or you would like to try on two sizes side by side to determine which has the best fit, simply place an order for the new wetsuit and send one back as a return instead of an exchange – as long as it is not permanently damaged or written, as above, and within the designated time frame. To submit a return or exchange, please print and fill out the Returns & Exchange Form, and include it with your returned wetsuit. Please read our terms & conditions carefully before placing your order. By using this website and placing an order you agree to be bound by these terms. 1 - The order was not signed for because the customer was not present at the listed delivery address. 2 - The order could not be delivered because the address provided by the customer was incorrect or incomplete. All wetsuit hire orders will be shipped at least 2 days before the desired hire start date, in order for the wetsuit to arrive in time. As per Australian tax laws a 10% Goods and Services Tax (GST) is included in pricing and it is the responsibility of the individual to claim this back, where eligible. All new wetsuits come with a 30-day size guarantee (ex-hire wetsuit purchases are final with no guarantee). If the wetsuit doesn't offer you a perfect fit, we will happily accept a return or exchange within 30-days of receipt of the order. In the unlikely event you feel that you have been delivered a damaged product and/ or wish to return it, please email us at contact@titanperformancegroup.com.au. All our hire wetsuits are checked prior to dispatch for previous wear and tear and any defects noted on a wear and tear form. If you order the incorrect size and need to exchange (subject to availability) or return please contact us to discuss. Please note a re-stocking fee of $20.000 will be charged. Wetsuits can be returned in person (TITAN Triathlon Multisport, Shop 3, 367-369 Brighton Road HOVE SA 5048) or by post. You can choose any suitable postage method/ carrier and you are responsible for paying return shipping. All hire wetsuits must be returned before or within 2 days of the agreed hire end date (wetsuits must be clean, dry & with a completed Wetsuit Hire Returns Form), otherwise it will result in an additional charge as described in the "Charges" section. Include your name and address so that we can identify the wetsuit. It is the responsibility of the customer to return the wetsuit. Recorded / tracked / signature required delivery is recommended. We will email you upon receipt of your wetsuit. We accept payment by credit, debit card or EFT. All credit and debit cardholders are subject to validation and authorisation by your card issuer. If the issuer of your card declines payment, you will be notified at the point of purchase. The following points outline possible fines that could be charged to your card. No charge will be made before we contact you (by email) to inform you of our action. 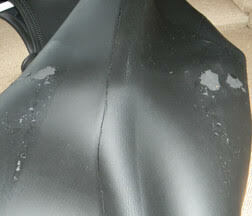 1 - Dirty/ Wet Cleaning: If your wetsuit is returned to us dirty or wet we will charge you $30.00. 2 - Damage: Each rip/ tear or any other undue damage will result in a charge of $300.00 per incident. Any wear or tear already made to the suit will not incur a charge, please contact us immediately if this is the case. 3 - Late or Non Return of Wetsuit: If your hire wetsuit is not in our possession within 2 days of the agreed hire end date we will charge you an additional $50 per week until the full retail purchase price of the wetsuit has been reached. This charge will be taken from the original card provided. 4 - Any wetsuit returned without the returns form will incur a $30.00 administration fee, which will be taken from the original card details provided. We do not offer refunds on hire wetsuits returned early or unused. We do not refund for wetsuits if the wetsuit hire is cancelled within 48 hours of the wetsuit being hired out. Any orders cancelled before the hire date will incur a 20% admin fee. If cancelled within 7 days of hire we will charge a fee of $30.00. 2 - Any change in conditions (race or otherwise) resulting in the wetsuit not being used. Triathlon wetsuits are manufactured for a high level of speed and flexibility. They are a performance product and are not indestructible. 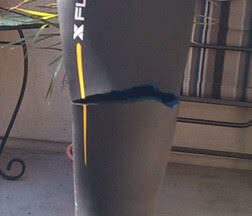 Although XTERRA Wetsuit's warranty is unrivaled, there are a few types of damage we don't cover. Below are examples of accidental damage and damage caused by improper care that are not eligible for warranty claims. Stress tears or "Fingernail tears" may or may not be caused by direct contact with fingernails. Fingernail and other minor tears from sharp objects are not a manufacturing defect. Minor tears like this will not affect the performance or integrity of the wetsuit whatsoever if it has been repaired correctly. Tears like this can be prevented by always using the pads of your fingers to put on a suit. Suits most commonly tear when pulled taught over the tip of the finger. It is also important never to pinch small folds of the suit and pull. The combination of the pulling and pinching can also cause the suit to tear. Make sure to grab large folds of the suit when pulling. The good news about these tears is you can easily repair them at home with a few drops of glue and about 5 minutes of your time. 1. Purchase/use standard wetsuit adhesive. Most swim, triathlon, or sporting goods stores carry this product; we recommend a product called Aqua Seal. Be sure to read all of the instructions that accompany the wetsuit adhesive you purchase to avoid discrepancies with the instructions provided below. 2. Lay the wetsuit on a flat surface. 3. Gently pinch open the tear in the wetsuit to expose both surfaces. Apply a thick, equal layer of adhesive to both surfaces. Use less glue on either edge of the tear than you think to avoid the glue from seeping out onto the surface of the wetsuit. 4. 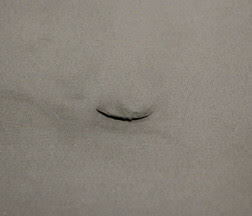 Position the tear so that it is flat (sitting naturally without any bumps or folds in the tear). Apply another thin layer of adhesive to the edges of the tear (or use the excess adhesive that seeps out of the tear once the flap is flat), and smooth the adhesive at the edge of tear with a paperclip or toothpick. Do not leave any adhesive on the surface of the suit; simply rub any excess adhesive off of the suit before it dries. 5. Leave the wetsuit on a dry, flat surface for 24 hours to dry. Note: Once dry, the repair can appear shiny and may have a raised area. This is normal, and will not affect the performance of your swim.